For this week’s Monday Morning Inspiration I have for you the beautiful Lana Turner! Dream big and make it happen! Sign up to Miss Lady Lace’s mailing list for your monthly dose of vintage glamour! Email contact@ladylace.com.au for sponsorship and collaboration details! 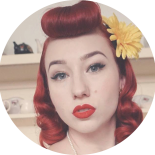 This entry was posted on February 26, 2018 by Miss Lady Lace in Monday Morning Glamour and tagged 1940's, 1950's, blogger, glamour, miss lady lace, miss lady laces pinup blog, monday morning, Monday Morning Glamour, perth, perth pinup, perth pinup blog, perth pinup community, pin up, pinup, pinup blog, pinup blogger, pinup fashion, pinup girl, pinup life, pinup lifestyle, pinup perth, red lips, retro blog, retro girl, retro glamour, the perth pinup community, victory rolls, vintage, vintage blog, vintage blogger, vintage fashion, vintage girl, vintage glamour, vintage perth, vintage pinup blog. Miss Lady Lace on Facebook! On Sunday we were at @disneyland and it really was a dream come true. 💖 many more photos to come!! A little behind sharing all the fun we’re having. I have very limited wifi. Disney photos are still coming but here’s some photos from the @madonnainn1958. Our first day here has been relaxing drinks and dancing, spa and exploring!! Day 99 of our 100 day of vintage. Last day in LA. 💖 Next stop Dapper Day! !